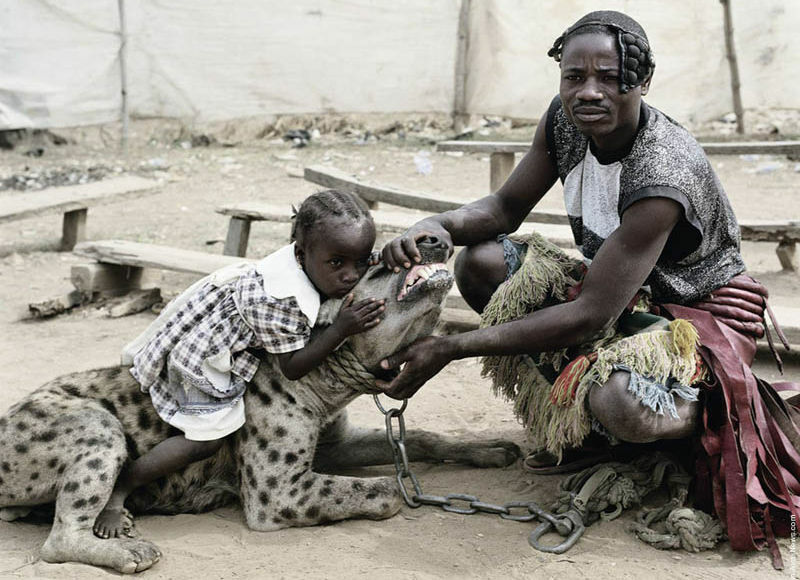 Hyena handler of Nigeria—a real-life lion of a man. Click to expand. A Harley biker is visiting Taronga Park Zoo, Sydney, when he sees a little girl leaning into the lions’ cage. Suddenly, a lion grabs her by the jacket and tries to pull her inside, in full view of her terrified, screaming parents. Whimpering, the lion releases the girl and recoils, and the biker returns her to her terrified parents who thank him again and again. The journalist takes his leave. And that, my friends, pretty much sums up the mainstream media’s attitude to those who question the global warming orthodoxy — h/t Ross Muir. I watched an interesting Nat Geo programme last night, tracking down the rumour that a grizzly had breed with a polar bear. Sure enough they did find one and got photos, yep definitely got grizzly features, but has a white coat. All credibility was lost however at the end when the scientists concerned gave the reason for this hybrid bear was climate change. I guess its these particular scientists speak for we don’t know why. I’d like to read that, Andy, but it’s behind a paywall. If you could find a copy I could post it here and save $25 a month. But it’s not essential. Adults should put on their own oxygen masks before helping children with theirs. That’s what they tell you on the airplane safety videos as you taxi out for take-off. If something went wrong in-flight and oxygen masks dropped from the overhead lockers, a parent might naturally look after her child first. But that may well result in both the adult and the child passing out and dying. Better for the adult to sort herself out first and then look after her child. Both will be better off. Imagine that, having understood this logic, an airline nevertheless recommended that adults make sure children had their masks on first—not because it would do any good but because it would be a nice gesture of concern for children. Looking after children first is the morally correct thing to do. You could only conclude that the airline had confused morality with moral exhibitionism. Doing something that, at first sight, appears caring but is known to be harmful is wicked. It puts a higher value on the appearance of your own virtue than on the real consequences for people. In the airline industry, such morally self-indulgent posturing is unknown. In politics, by contrast, it is common. Here in New Zealand, the Green Party, which makes up about 10% of parliament, is our leading exponents of moral exhibitionism in public policy. The party has recently proposed a tax on greenhouse-gas emissions from dairy farming. Someone giving the matter only cursory thought might imagine that this would reduce greenhouse-gas emissions. Give the matter a little more thought, however, and it is clear that the policy would increase greenhouse-gas emissions. The U.S. and the European Union are the other major producers of dairy products. Given the political power of agricultural lobbies in the U.S. and EU, there is no serious prospect of either imposing similar taxes on their farmers. If New Zealand did so unilaterally, as proposed by the Greens, dairy production would migrate from New Zealand to the U.S. and EU. Because of New Zealand’s benign climate, dairy production here uses less energy than in the U.S. and EU and emits less greenhouse gas. So the Greens’ policy would actually increase greenhouse-gas emissions. Never mind. Reducing emissions isn’t the real point of the policy. The real point is to be seen to care about the environment. Increasing emissions is a price worth paying to show that you want to reduce emissions. Environmentalism is not the only area where moral exhibitionism trumps morality. All around the world, politicians who want to be seen to care for the poor pursue policies that harm the poor. For example, most legislate minimum wages, despite minimum wages being well-known to increase youth and long-term unemployment. Never mind. Supporting minimum wages can easily be advertised as concern for the poor. Keeping young people out of the job market and permanently reducing their earnings is a price worth paying to secure a reputation for virtue. After all, the price is paid by the unemployed, not by the politicians. You might hope that exposing the folly of these policies would solve the problem You might hope that once voters see that no good is done by these apparently virtuous policies, they will reject them. And that politicians seeking a reputation for virtue will reject them too. Alas, there is reason to doubt it. The U.K. polling firm YouGov recently asked people if they would support a 50% top rate of income tax “on moral grounds,” even if it didn’t raise any revenue for the government. The results: 69% of Labour Party voters said they would; 56% of Liberal democrats would too; even 16% of Conservatives would. The alleged morality of applying high tax rates to high incomes is that the money gathered can be transferred to people with low incomes. If the high tax rate doesn’t in fact deliver more government revenue for redistribution, the case for it collapses. Yet, as it turns out, many voters don’t care. They favor the policy even if it does no good. For them, “moral grounds” don’t depend on actual effects. They depend only on the advertised intention, only on the symbolic connection with virtue, even when the connection is known to be nonexistent. Like those they follow, these voters have embraced the politics of moral exhibitionism. Here in New Zealand, when I point out that the Greens’ proposed tax would increase emissions, its defenders don’t argue that I am wrong. They yell that I put profits ahead of the environment, but they don’t try to counter that the policy would reduce emissions. Even if it increases emissions, Green voters support the emissions tax for moral reasons: that is, for reasons of showing off their morality. In the 1980s, “right on” students like “Rick” from the BBC comedy “The Young Ones” literally wore badges advertising their moral concerns: “Free Mandela, ” “Save the Whales” and so on. The trendiness of the badges made older people suspicious of the students’ moral seriousness. Mr. Whyte is the leader of the ACT Party of New Zealand. This month, his “Quack Policy” paper won the Arthur Seldon Memorial Prize for Excellence from the Institute of Economic Affairs. I found that if you Google for “Political Virtue as a Fashion Accessory” you get to the article unpaywalled, even though the URL seems the same..
“you get to the article unpaywalled” – not for me, unfortunately. Perhaps you were still logged in. But it’s a great piece of writing.